Grilling a sandwich makes the outside of the bread (or wrap) toasty and crispy, and makes the filling all warm and gooey. How do I Grill a Sandwich ? You can grill a sandwich on your stove top, using a frying pan, a cast iron skillet, a cast iron griddle or a grill pan. Other options are the George Forman Grill, a panini grill or a toaster oven. For more information on these indoor grilling options, scroll down below the recipes. If you have an outdoor barbecue, fire it up, oil the grate and throw (well, not literally) your sandwich or wrap on the grill. Be careful not to let the filling drip through the grates. Grilling a sandwich on an outdoor grill adds a smoky flavor to an otherwise ordinary sandwich. 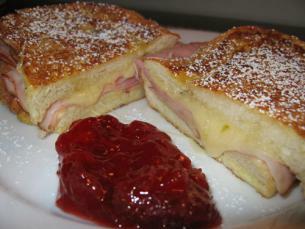 This Grilled Monte Cristo Sandwich (shown above) will knock your socks off! It’s basically a ham and cheese sandwich, dipped in egg and milk and French toasted. Paired with strawberry jam and mustard, this is a real unique taste treat! Here’s an excellent example of Grilled Vegetable Panini using a panini grill. These step-by-step instructions with photos show techniques and ingredients for a delicious game-time sandwich. These can also be made on the barbecue or a stove top griddle using a weight to flatten the sandwiches. How about a Grilled Peanut Butter and Jelly Sandwich. You can make it a bit healthier by using natural peanut butter and all fruit preserves. Want to Reinvent the Peanut Butter and Jelly Sandwich? This link has some really great ideas, including bacon, bananas (the Elvis sandwich), mayonnaise, potato chips and raisins. For an easy breakfast sandwich try slicing a croissant or an English muffin in half and butter the insides, or butter two pieces of your choice of bread. Place it on a hot griddle, or frying pan butter side down and grill until evenly toasted. Remove to a plate. Place a slice of cheese on one side and a slice of cooked Canadian bacon (or another meat of your choice) on the other. Meanwhile, fry two eggs and when they’re done, assemble your sandwich with the eggs in the middle. Season to taste. The heat from the hot eggs will melt the cheese and you’ll have a tasty breakfast sandwich! 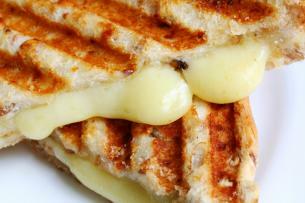 Let’s not get to carried away and forget about the classic white bread and American cheese Grilled Cheese Sandwich. I’ve had a fascination with a Cuban Sandwich ever since I had one at a local restaurant. It was grilled to perfection, succulent and full of flavor. It also looked easy to make. Cuban Sandwiches for Beginners is a great place to start for lots of tasty ideas. This simple Grilled Cuban Sandwich uses sliced turkey and ham, cranberry jelly, cheese and a pickle. There’s no rule in the handbook that says you can’t grill a BLT! Although not technically a grilled sandwich, the all-American and beloved BLT would be awesome if you toasted it on a hot griddle. Cast Iron Skillet: This might have been the first grill pan ever to be used! Save some money and dig out your trusty old cast iron pan. It holds the heat, it grills evenly and if it’s been well seasoned over the years, it’s virtually non-stick! Cast Iron Griddle: I have a large rectangular cast iron griddle that is ridged on one side and flat on the other. It lays across 2 burners and uses the heat from the stove for cooking. I’ve used this not only for sandwiches, but also French toast, pancakes, grilled chicken and much more. Grill Pans: Special non-stick grill pans come with either ridged or flat surfaces. The square pan is the perfect shape for square sandwiches! These come in handy when you want to make a quick sandwich and don’t want to plug in or buy another appliance. The advantage to these pans? They can be taken camping, too! The George Foreman Grill is probably the most well-known electric grill today. Foreman claims that it “Seals in the flavor and knocks out the fat!“ They come in all sizes and prices and are non-stick, making them a good choice for sandwiches. Panini grills are not just for restaurants. You can get them in virtually any size and price range. Wise Geek has the best explanation, but it’s a counter-top grill that is hinged and grills both sides of the sandwiches, hopefully with those appetizing ridge marks. It’s either a great time-saver or a big space-waster, depending on the size of your kitchen and how often you use it. Toaster Oven: There’s probably a wedding gift sitting on a shelf in your basement covered in dust. Get that toaster oven out and start using it! It keeps the kitchen cool on a hot summer day and does a lot more than make toast! It broils open-faced sandwiches, makes an excellent Tuna Melt, and kids of all ages will love English Muffin Pizzas! Have the best of both worlds with English Muffin Pizzas with Tuna Fish! You forgot two great grilling options, Donna! 1. The tried and true bachelor method of wrapping the sandwich in waxed paper, and ironing it with a clothes iron. This really works! And if you don’t have nice cooking appliances and you want a no-mess grilled cheese sandwich, it is a great way to cook up some food fast with limited cooking facilities (in a dorm room for example). You can iron it on your ironing board, or just on a folded towel sitting on your counter. 2. The more obscure method is…wrapping your sandwich in wax paper or parchment paper and then tinfoil, and strapping it to your car manifold. There’s a whole secret world out there of car cuisine pioneered by hunters and fishermen. If you think about it, this is a really green way to cook, since you’re using heat that is already being produced anyway. We’re on a road trip right now, and we’re trying to figure out the best way to strap sandwiches to our Mini Cooper. If we manage to make a good grilled cheese, I’ll report back with the results! Love the idea of grilled peanut butter and jelly. I am definitely going to try that! Oh Shaula, how I would LOVE to see you grilling on your Mini manifold! I’ve heard tale of truckers actually cooking whole a roast beef on their manifold! Kathy, you just made me spit tea all over my keyboard at the thought of trying to strap a roast beef to the manifold of the Mini! Can you imagine…maybe we could manage a single frog’s leg, but even a filet would make the Mini explode. If we do any manifold cooking I will try very hard to get pictures. It is such a great opportunity, I think we just have to try it! Great post on the different ways of grilling sandwiches! Never thought you could grill a peanut butter and jelly sandwich. Definitely have to try it. The kids will love it. Grilling on a manifold is a great idea. I’m sure that would be some messy disappointments on your way to figuring that method out.